Ugh...the Rangers are still didn't trying to destroy Gangler safe box again. Yeah sure, logically they could. 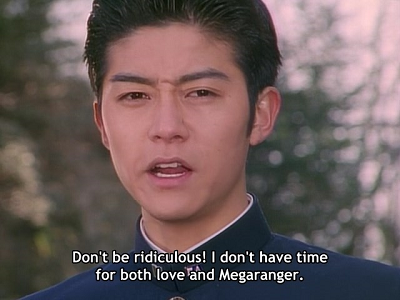 The Ganglers could also murder them while they pose and henshin so, this series has not been very consistent when it comes to in combat henshins, other series have done a far better job at it. Either way, it is a trope. Which is not a negative per say but yes it is silly. I know I'm usually extremely positive about LuPat, but I have to say this episode was a bit rough. Which ordinarily I would expect from episodes not written by Junko Koumura, but since the last three of those were actually pretty good, this felt rather disappointing. I appreciate the attempt to actually develop the characters instead of doing a straight filler gag episode, but it strikes me as odd to have Kairi start warming up to Keiichirou in such a mild story when it seemed obvious to me Kairi's growing enmity towards him was meant to build towards something much more exciting and climactic. The toy promo stuff was just pathetic though. Marvel at the excitement as Kairi uses his newfound precognitive abilities to... aim at a guy! It's bad enough I'm still not over Noel stealing Keiichirou's super mode, but then they go and make the first time you see both power-ups together a total non-event. For how much I'm criticizing it though, this was a reasonably fun episode with some great humor, so it's not like I didn't enjoy myself. I didn't hate this episode at all, but when I think of things to say about it, it just comes to the usual complaints and nitpicks I have had for a while now. I expect that Kairi and Keichiro are still on their way to having a big dramatic moment, even if this episode tries to make it look like they're pedaling it back a bit. Also is Pat Kaiser just never going to show up again! ?